Sorting through more than 850 photos of Arizona’s amazing wildlife is a wonderful challenge for our judges. The moment has come to announce the winners! James Stamsek’s photo of mule deer at Lost Dutchman State Park was awarded best in show and will be showcased on both the cover and in the calendar. More than 300 photographers entered this year’s wildlife photo contest. Twelve winning images are published in a full-size 2019 wildlife calendar in the November-December 2018 issue of Arizona Wildlife Views magazine, which is on sale for $3 at all Arizona Game and Fish Department offices. 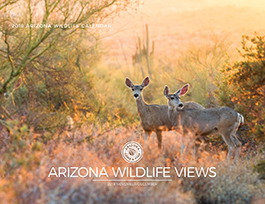 The Arizona Game and Fish Department welcomes new subscribers to the state’s award-winning magazine about wildlife and outdoor recreation. The regular price is $8.50 for six issues (one year), but through Dec. 31, subscriptions are on sale for $7 for seven issues. They can be purchased online. Those who subscribe by Dec. 31 will receive the calendar issue showing this year’s winners and honorable mentions.